I have wanted to go to Great Basin National Park and Ely Nevada for a long time, but beach trips keep getting in the way of my best laid plans. I know it’s not a terrible problem to have, I just like some variety in my life. But I decided Fall Break it was going to happen, whether or not anyone else wanted to come with me. Originally it was just going to be me and the kids. Justin was supposed to be on a boys trip in Memphis. But a back injury kept him home with us, and he decided that the short drive might be bearable if we stopped every hour or so. We’re so glad he came. We got up early and headed straight for Leihman Caves in Great Basin National Park. They were pretty magnificent. A highlight: standing in complete blackness. When the lights came back on max had his arms wrapped around Anna in a death grip. After seeing all the stalactites, stalagmites, cave bacon, pounding on the cave door to simulate an earthquake, and looking for bats, we headed outside for a picnic. I loved all the Fall colors. It’s still fairly summery where I’m at. AJ wasn’t too keen on letting Justin rest. Anna taught us how to play “Will you Marry Me?” Then we drove up 7500 more feet. 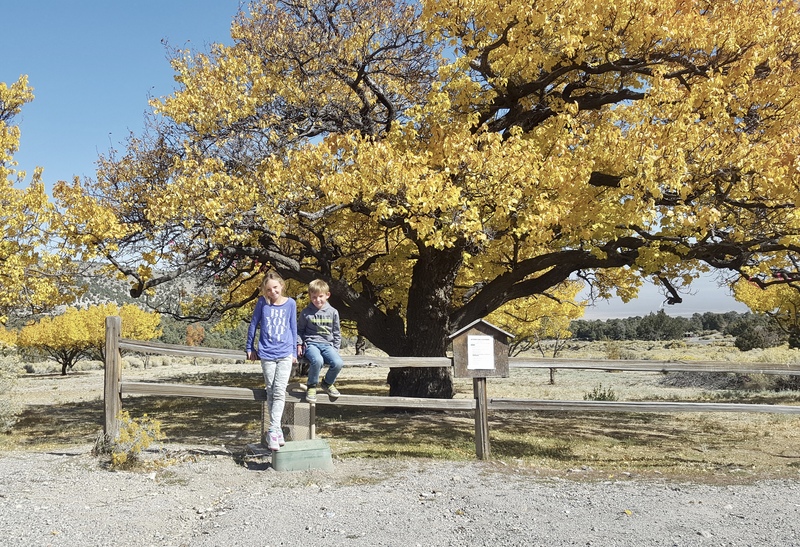 Justin and AJ napped in the car, while the kids and I hiked up to the Bristlecone pine trees. We weren’t very prepared for the icy trail, and got a few sideways looks from hikers, but we made it. Unfortunately my phone died in route so I have no pictures, but the trees were worth every step. Most of them were thousands of years old. It always awes me a little to be near something that ancient, to wonder what it’s born witness to in its life. Josh and went a little farther to see the glacier, and then we all headed down to our hotel. Hidden Canyon Retreat. Was between two tiny towns 7 miles off a dirt road, and it was the best part of our trip. These guys were hanging out while we drove to our room. We were some of the only guests and had the outdoor hot tub all to ourselves that night. We soaked and looked at thousands of stars. Anna got some whittling done. And my family is now all convinced that we need a ping pong table. The property was beautiful. “On the way home” which turned out to not be quite as on the way as I’d planned. We hit up the Northern Nevada Railway for a ride on a steam engine. FYI when engines run on coal it rains down from the sky on you while you ride. AJ thought it was too cool to take a nap. Your train ticket includes a walking tour of the yard, which we only made it through half of, because of a baby that hadn’t napped. But the kids loved it. It’s a working yard, meaning that there were guys in there working on engines, they got to see all the tools and I may or may not have been worried that someone was going to fall into one of the pits and die. An authentic experience:) I love random trips.